Welcome back to the University of Wisconsin-Stout, students! After a holiday season full of overbearing family, estranged friends from high school and working full-time, we here at the Stoutonia are sure you are looking to blow off a little steam. After working over break and receiving money for the holidays, your next step is to decide what to spend that money on. Luckily for you, this article contains that exact knowledge! 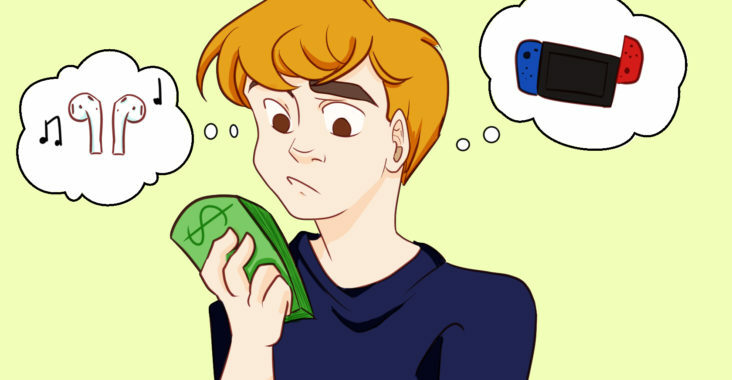 Let’s look at the top three most commonly sought-after items for a college student whose wallet is a bit more stuffed than usual. Everyone loves the holiday season, except for cars. The intense cold is bound to have ruined something in your vehicle. Whether you need new tires or brakes, the repair is not going to be cheap! It’s likely you are absolutely brimming at the idea of sinking more money into your car, but try not to spend all of it. There’s still so much more to lose! Oh boy, February is just around the corner, which indicates that rent for off-campus students is due soon! This means another monthly payment towards cheap college housing, which is just what you were hoping for. In fact, you might want to put even more of that money away for this one. With the remainder of your pitiful financial state, you can (probably) afford a trip to Aldi. There, you can stock up on your favorite off-brand cereals, chips and basic necessities, such as tissues! Make sure to get the bare essentials first because you might not get to those once the checks from work stop coming in. That concludes the holiday shopping guide for a college student. Do not worry too much about the extra money floating in your bank account. Everything will be back to normal in no time.